Yogyakarta, a city of culture as well as a famous tourist attractions in Indonesia, this city will always be offered for those who have been longing to visit it. When he came back, every corner of the city will welcome you with its distinctive atmosphere. Region that is identical to a university town is Malioboro. 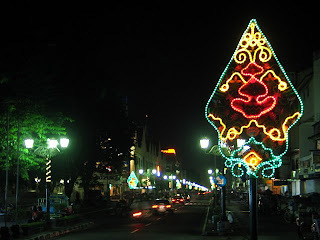 Malioboro is the most famous street in Yogyakarta. Located in the heart of Yogyakarta, the main road into the path of this Sultan during the ceremony on the way to and from the palace. 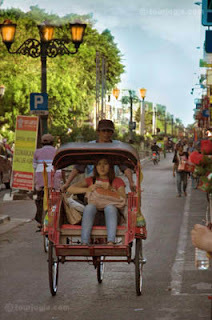 If you came to Jogjakarta by train, from Monument Station, Malioboro can be visited on foot, ride tricycles, or use a horse carriage commonly called a carriage. But the best way to enjoy Malioboro is on foot. Many interesting tourist attractions around Malioboro. Near the north gate of the palace, you can find the Dutch colonial buildings of the palace is now a large Post Office. Walking further north, you will find State Guest House, once the home of the Dutch resident, but after independence became the presidential palace when Yogyakarta was once the capital while. President Sukarno lived here between 1946-1949. Across the street from State Guest House is a castle Vredenburg, which is used as the Dutch army barracks and now a center of art and painting exhibition. On the same road, you can also find a market that is always crowded Beringharjo. This market offers batik and souvenir items at low prices. Still in Malioboro you will also find the oldest hotel in Yogyakarta, Garuda Hotel, built by Dutch colonial architecture. Now, Malioboro is a place with lots of shops. In this area, you will find a wide range of goods, as well as street vendors offering souvenirs with affordable prices, so you'll find something interesting in this way. In Malioboro shopping, you can buy some batik to take home as a memento. The creation souvenir batik has become bags, tablecloths, bedspreads, pillowcases, curtains, and more. You just choose which one is preferred. Malioboro and Yogyakarta will always present longing for you who want to experience the simplicity and friendliness.